I mentioned in a previous random picture post that marketers are gearing up to make it easier than ever to endure the heat in Japan due to higher air conditioner settings and reduced use to keep power consumption down while the Fukushima situation continues on. One of the things that is showing up all over the place from a variety of manufacturers are packages of liquid-creamer-style tubs of syrup to add to milk for instant lattes. Though these have been around before, the variety is greater this year, the prices are fairly low, and syrups with low calories rather than sugary powders seem to be the new cold coffee order. The Japanese describing what this is translates as "potions". That conjures (no pun intended) up an image of magical transformation. No, I'm not fooled either. I think "syrup" is a much better translation, but I'm guessing the use of "syrup" often applies to sugar-based things (honey syrup, for instance) and brings up the wrong idea to Japanese consumers. So, "potion" it be. 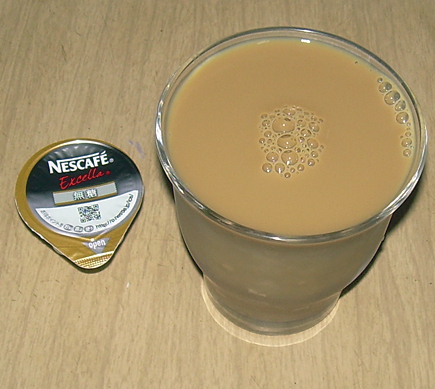 The coffee latte mixed with milk. When I saw bags of these syrups on offer for a mere 85 yen ($1.06) each at Seiyu supermarket, I figured I'd go ahead and take a bite... or a sip as the case may be. 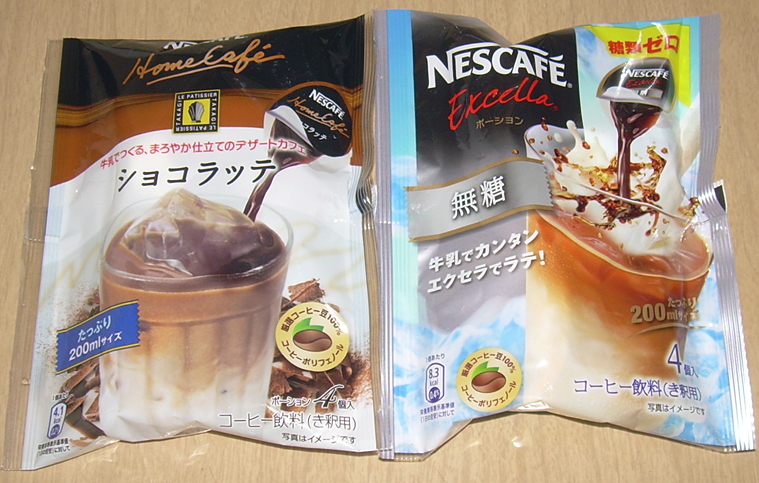 There are 4 servings in each bag, so it's only about 21 yen (26 cents) per serving, though that doesn't include the 180 ml. (a bit less than a cup) of milk that you use. It's still going to be a lot cheaper than a Starbucks latte, but then that isn't going to taste like some sort of instant coffee. And that is rather what the coffee version of this tastes like. It's not a bad version of instant coffee, mind you. 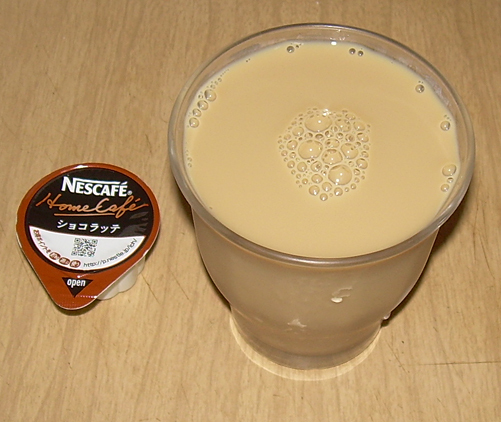 It's actually pretty palatable and makes for a serviceable "coffee-flavored milk". The "chocola" latte mixed with milk. The chocolate latte version of this mixes up a lot lighter and tastes a lot like you added Hershey's syrup to your milk. The coffee part is extremely subdued, but makes more of an appearance as you drink more. It's as if it needs a build-up in intensity to manifest. However, you really would be just as well off adding about a half teaspoon of instant coffee and a tablespoon of Hershey's chocolate syrup to your milk. It'd cost less. My lukewarm-sounding review to these cold beverages isn't to be taken in a negative way. The truth is that I enjoyed both of these, though the way in which I consumed the chocolate version after the first sampling was not as one might expect. I like to have a frozen banana drink composed of skim milk, frozen banana, and crushed ice with a dash of vanilla. I put this in a blender and blend it is smooth and thick. Pouring the chocolate coffee syrup into this concoction was incredibly delicious. In fact, I'd wager the plain coffee would work pretty well in this drink, too. I'd buy these again if I wanted a cold coffee beverage and didn't have the time to chill espresso, or if I wanted to vary my frozen banana drink. They're cheap and will keep for awhile. In fact, I'd think they would be ideal for the office if you have a refrigerator and can keep a carton of milk in there. Still, don't expect much in terms of a quality coffee experience or you'll be sorely disappointed. I'm still not sure if it's supposed to be "potions" or "portions". On some days, one possibility makes more sense than the other. A Japanese person told me it was "potions". That doesn't make it correct, mind you, but that's why I went with it. I trust my katakana, but, as you point out, I'm not sure we can be certain either way! I used to love drinking these during the hot Japanese summer months. It was breakfast drink of choice.